Sebamed was originally established in 1957 by German dermatologist Dr. Heinz Maurer and is now recommended by dermatologists and skin experts worldwide. The Classic Cleansing Bar was their pioneering product and all of their range, including the popular baby range, have been developed to have a pH level of 5.5, which is the same as healthy skin. Did you know that healthy skin is slightly acidic? Not a lot of people realise this, and what they also don't realise that when regular soap is combined with water it forms an alkaline solution with a pH level of between 8 and 12. This isn't great for our skin as it strips it of its protective acid mantle. That means the skin’s natural defence against pathogens, irritants and dehydration is reduced until the acid mantle regenerates a few hours later. Now that the science lesson is over, I'm sure you'd like to know more about the Sebamed Baby products we've been using. We were sent the Baby Lotion, Baby Cream, Children's Shampoo, Baby Bubble Bath and Baby Cleansing Bar; a real top to toe selection. The range is hypoallergenic, cruelty-free and dermatologically tested to be kind to young skin and is suitable to use from the first day. The boys were really excited to try this out as usually their baths consist of using Little N's prescription bath emollient, which is rather boring and makes absolutely no bubbles. The instructions suggest using just a few drops in a baby bath, but as these two have a proper bath I put a good squirt of the solution so that they would have lots of bubbles to play with. The bubble bath, along with the rest of the range, smells so lovely: it's that classic soft, baby product smell. The boys had lots of fun using the bubbles to make beards and their skin is always lovely and soft after their baths. The shampoo from the Baby Sebamed range is a gentle, no tears formula which promotes a healthy scalp and healthy hair growth. It foams up well and rinses away easily leaving their hair clean, smelling fresh, and tangle-free. J's hair is getting quite long now and often he can have a few knots after a hair wash, but his hair is always easy to comb after washing with this shampoo. I always moisturise the boys' skin after their baths. It's become a habit with Little N having eczema so it's a step I never miss, otherwise his skin can get really dry and irritated. This baby lotion is absorbed really quickly and leaves their skin feeling ever so soft without any greasy residue left behind. Their skin is left protected from dryness and I'm half-tempted to use it on my own skin! This cream offers intensive protection against dryness and irritation so it's ideal for using on the nappy area. I don't use nappy creams too often on J, apart from after his bath at bedtime, so we have been using this then. It's been a great barrier cream and has kept his little bottom protected from nappy rash at night time. He also had a little bit of a sore bottom recently after an upset tummy, and the cream was soothing on his poor skin. The tube is a great size and shape for keeping in a changing bag, so I'm sure this will be the one I take out and about with me when baby girl arrives. This product I actually decided to keep for myself! The boys use the bubble bath to wash with anyway, and I suffer with eczema on occasion especially on my hands, so the cleansing bar was ideal for me to use. The bar is suitable for use on the whole of the body and it is made with wheat germ oil, vitamins and amino acids to nourish and hydrate the skin. Like the rest of the range, it smells lovely and helps to keep the skin's acid mantle protected. I'm really pleased with this range; it is so gentle on the boys' skin, even with Little N having eczema, and I just love how it all smells! I will happily be using it all when the new baby arrives. 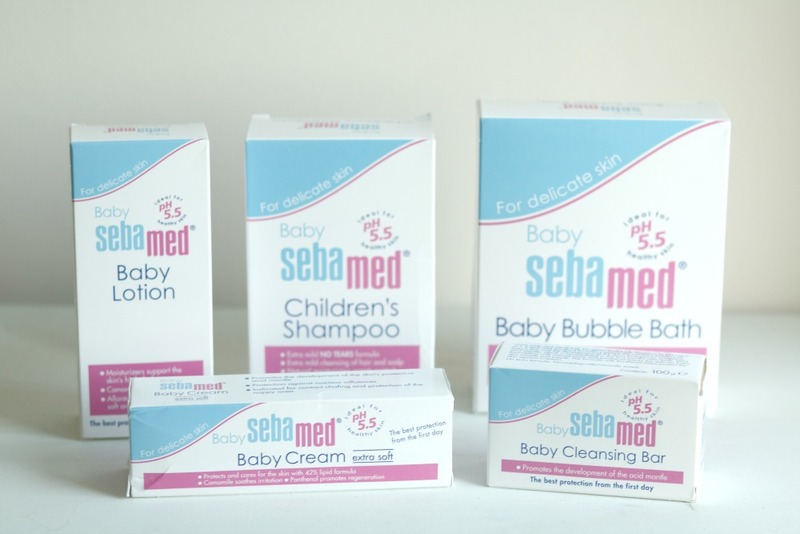 To find out more about these products and the rest of the Sebamed Baby range, pop over to their website. With thanks to Sebamed for sending us these products to try.